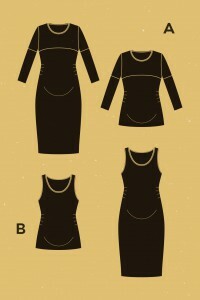 Givre maternity adapts to your changing body! It includes two sizes of belly (3-6 months and 6-9 months) in order to accompany you all along your pregnancy. Get 8€ off your purchase if you buy Givre + Givre maternity! 13,20 €11,00 € tax incl. Fabric used for versions B - dresses: Cotton-elastane jersey - Rascol. Fabric used for version A - top: Organic cotton-elastane jersey - Lebenskleidung. Camille's measurements: 5'8" - 34½"/39⅜"
Eleonore's measurements: 5'7" - 35"/40½"